In this miserable cold weather, what better than a bowl of hot soup to cheer anyone up? I picked an organic lentil soup from the supermarket shelf this week in the vain hope of drinking dhal at my desk. But dhal it wasn’t. More like boiled lentils. I immediately wrote to the manufacturers asking them to change key ingredients like parsley and carrots to coriander and tomatoes. No reply yet. Is this how Simplyorganics treats its valued customers? Anyway, dhal soup got me thinking. 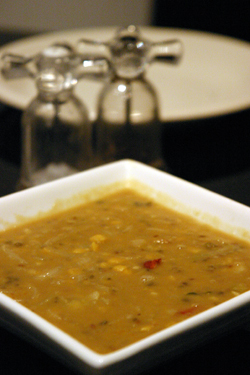 About dhal and about soup. Drinking dhal on its own is not common practice in India. But I love soup and if a curry house is allowed to call sludge food, why can’t I drink dhal? So this week I tried a new soup – a dhal inspired by the Hyderabadi Char Dhal ka Dalcha. It’s a combination of four lentils, with added masalas, and can be versatile to accompany rice, roti and just drunk as soup. But I’m slowly running out of ideas and I’d be really interested to hear about your great soup recipes. Wash the dhal until the water from them runs clear. In a pot, put the lentils, the turmeric, half a teaspoon of chilli powder. Boil the lentils on a medium high flame, stirring from time to time. You need to keep adding water when the mixture dries up to make sure the lentils cook. Or just pressure cook the whole lot. In a small pan, heat the sunflower oil and when hot fry the ginger and garlic. When they start turning brown, add the onions and fry until they start going brown too. Mix this into the lentils when the lentils look like they are almost cooked. They will start getting a smooth consistency with the chana lentils retaining their shape but going soft and squidgy. In the same pot that you fried the onions, heat the ghee and fry the whole cumin seeds, the whole red chillies and the curry leaves. When the curry leaves start letting out a glorious aroma, add the mixture into the lentils. Stir the dhal well and simmer for 5 minutes, mixing in the tamarind paste and salt to taste. p.s. I’ve added a link over to your site on Cooking Chat. I like your blog and will have to try some of the recipes. o soup recipes from m, but your dhal looks great! when I workd in an office I used to always drink my soup! I recently made this recipe from the Zen Foodism blog and found it absolutely heavenly. The only change I made was to substitute 1 tsp dried for the 1 Tbsp fresh dill. One more recipe — this one’s a soup with red lentils and bulgur wheat. Have no idea where I got it from but I thought it was delish! Don’t omit the mint, it really gives the soup a little extra kick! It’s also very good with the addition of some shredded chicken breast to make it a little heartier. Melt butter in a large pot, add the onions and saute until soft, 5 to 7 minutes. Stir in the garlic, spices, and salt and pepper, and saute another minute to release the aromas. Stir in the tomato paste to blend with the onions, fry 1 to 2 minutes, then add the stock, bulgur and lentils. Cover and simmer until bulgur and lentils are thoroughly cooked and soup is thickened, about 30 to 40 minutes, stirring occasionally. Remove from heat, stir in half of the herbs and sprinkle the remaining half over the soup. Serve immediately with yogurt to garnish (optional). Thanks so much for the wonderful recipes… I must try them and get back to you. Drinking a mug of soup is completely wonderful, especially on a cold clammy day when stuck at one’s desk. I tried your recipe, char dal ka dalcha. It’s FANTASTIC!!! as desired, here’s the recipe for a tunisian chickpea soup which you may want to try. i made it and found it absolutely wonderful and filling. it goes rather well with baguette instead of day-old bread. Chick peas, day-old bread, lemon juice, and olive oil (and harissa*, Tunisia’s famous hot sauce) are the basic ingredients needed to make Lablabiâ€”a soup in Tunisia. Wash chick peas and soak them overnight. If desired, rinse chick peas. In a large soup pot, cover chick peas with water, bring to a boil, and cook until tender (ten to twenty minutes). â€” Or start with two pounds of canned chick peas, drained and rinsed, and heated in four cups of water. Add garlic, harissa sauce, ground cumin, and salt. Simmer for ten minutes. Immediately before serving: add lemon juice, olive oil, and bread crumbs. Serve hot. Some cooks add a pinch of bicarbonate of soda (baking soda) to the water in which the chickpeas soak. A more traditional method is to start with whole cumin and grind it immediately before preparing the soup. The soup can also be served by placing portions of bread crumbs in each soup bowl, ladling the soup over the bread, and pouring equal portions of lemon juice and olive oil over the soup. Serve with additional harissa on the side. A richer lablabi soup can be made by frying the garlic, some chopped red onion, a chopped carrot, and some chopped celery in olive oil, and adding this to the cooked chick peas. Additionally, the chick peas can be cooked in chicken broth or chicken stock. Lablabi soup goes well with hard-boiled egg or pan-fried fish. Chick peas (chick-peas or chickpeas) are also called garbanzo beans and ceci. They are common in Mediterranean, Indian, and Middle Eastern cuisine. * A spicy-hot sauce from Tunisia, harissa sauce (or harissa) is made from hot chiles, garlic, cumin, coriander, caraway and olive oil. Harissa is served with couscous and is also used in soups and stews. Commercially-produced harissa in cans and jars may be obtained at Middle Eastern grocery stores. Hi mallika great recipe jus wondering which moong dal did u use. Whole moong or split. can’t wait to try out this soup.